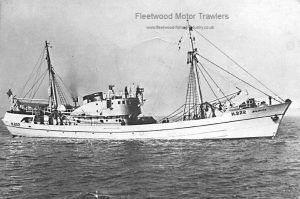 August 21 1951: Launched by Cook, Welton & Gemmell Ltd, Beverley (Yd.No.852) for City Steam Fishing Co Ltd, Hull as HILDINA. 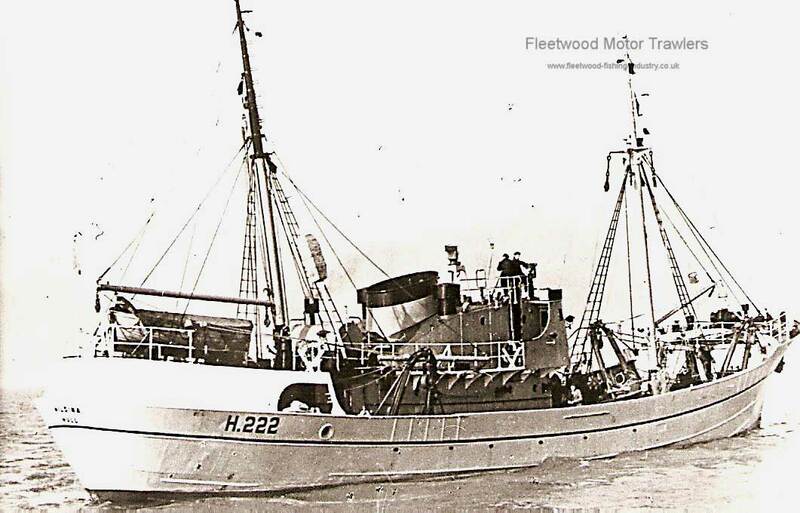 April 29 1952: Registered at Hull (H222). 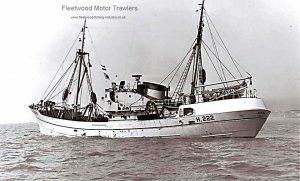 25.11.1953: Sailed Fleetwood for north-West of Scotland fishing grounde (Sk. George Goodwin Clarkson). 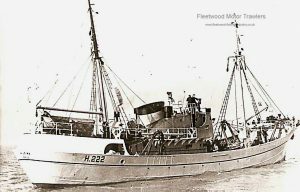 26/27.11.1953: Fishing halted for five hours due to problems with the winch power generating machinery. 29.11.1953: Trawl fast on sea bed. Cleared but came fast a second time. Cleared again but wind and sea state caused fishing to stop. Dodging. 30.11.1953: Conditions improved and trawl shot away with 350 fathoms of warp paid out. Between 07:55 and 08:00 the gear came fast again. Bosun Ernest Summers arrived at the winch within a minute. Deckhand knocked out and the bosun hove the forrard drum three or four turns and then both warps were hove in 25 fathoms. The vessel had fallen off into the weather and shipped a heavy sea on the starboard side and began to list heavily to 40 degrees. On the order of the skipper the clutches were unshipped as the winch wouldn’t run back. The mate (John Moran) went to cut away the gear but couldn’t find an axe to do it with. Deckhand George Albert Hayes tried to shut the starboard accommodation door but was unable to do so. 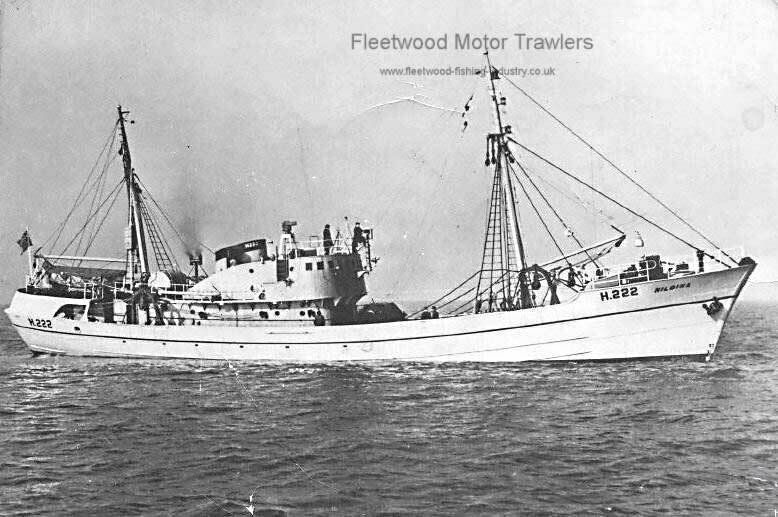 01.12.1953: Vessel filled through deck openings and sank by the stern 50 miles north by west of Sule Skerry. The BOT inquiry into the loss received evidence from the survivors and was satisfied that the skipper and crew were competent, reliable and trustworthy. Note: The remainder of the crew decided to try and launch the lifeboat but unfortunately it was damaged and floated away bottom up. The remaining crew went to the top of the bridge where the Nott buoyant apparatus was located. They managed to launch the Nott and eleven men managed to board. Unfortunately a big sea overturned the Nott and two men were carried away by the sea. The Fleetwood vessel VELIA FD116 picked up the HILDINA’s SOS message at 8:12 a.m. The skipper of the VELIA Charlie Pennington hauled his gear and headed to the location of the stricken vessel arriving at about 9:00 a.m. On arriving at the location VELIA managed to pick up 10 men. Two other trawlers where on hand to help ‘MONIMIA’ and ‘MARGARET’ who continued the search for any more survivors. VELIA headed to Stornoway to land the survivors. Unfortunately one crew member died on the way in. 11/09/2016: Page re-published due to site problems. This entry was posted in Lost, Marr, Motor Trawler on 11th September 2016 by Howard Small.